Tarot Card Readings: 5 Crucial Mistakes You Must Avoid! Whether you’re a beginner Tarot card reader or an experienced professional, eventually you will decide you want to do a reading on yourself. It’s only natural that you would want to, especially after you are familiar with the reading process and know how much power the cards may hold in providing both insight and guidance into different aspects of your life. There really isn’t an incorrect method of reading your Tarot cards, but you should know that different spreads may work better when doing a reading for yourself. A common mistake is that you may choose a more complicated layout that will give you too much trouble when trying to read it for yourself. A three-card spread, on the other hand, can be ideal for even complex problems you are trying to find answers to. After you do the initial three card spread Tarot reading and you isolate an important component you want to look into more, then you can think about doing a more complex reading. One of the biggest mistakes you could make when reading Tarot cards for yourself is to do so when you are emotional. If you reach for your deck right after an emotional interaction with your supervisor or a significant other, your heightened emotional state could make you susceptible to mistakes. If you are not in a clear mindset, you will give yourself an inaccurate reading. If you draw cards in an emotional state, you will most likely draw out the cards that you fear the most, therefore making you feel even worse. If this happens, you may decide to do another reading to further investigate and this just makes matters worse and worse. When you’re feeling emotional and would like to see what the Tarot cards may have to say about it, then this is the ideal opportunity to find a friend or mentor to perform an objective reading. Another option is to take a beat to cool down and clear your mind before getting a reading. This is ideal because if you are too emotional, you might have trouble truly listening to another reader. When you do a reading, it can make sense to draw additional cards in order to clarify another that was a little vague. For instance, if you draw a card that means you have a big decision soon, such as the Two of Swords, you may feel like drawing two more cards in order to figure out what your choices are. This is a completely logical line of thinking; however, you should be cautious about taking it too far. After drawing that initial clarifying card, you may be tempted to draw one more, and then another, and another one until you are satisfied with the cards that you have drawn. After you have accumulated so many cards, you will just have a collection of conflicting meanings that will make you even more confused. Another possible outcome is that you will simply be unhappy with what you have read because they did not show you exactly what you were hoping to read. A good rule to follow with clarifying cards is to only draw them when it is logical for the situation or when you feel like you really need to. When you interpret your own reading, it can be easy to make the mistake of looking for a ‘convenient’ interpretation for yourself, especially since you are quite emotionally invested into the situation already. When you do an interpretation, you already have your own opinions and beliefs that are preexisting, and these can cause you to interpret the Tarot cards in a specific way. Remaining professional and objective when doing your own reading can be a very tricky job. 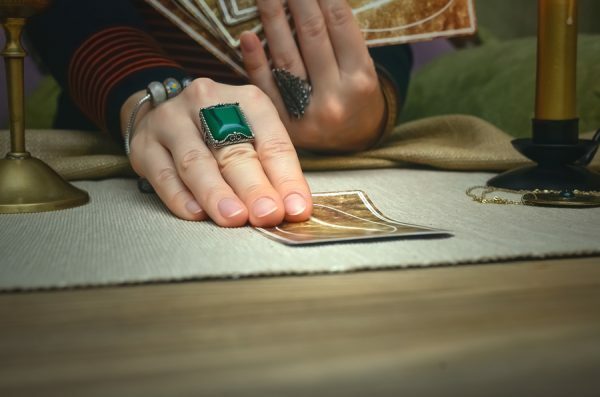 While you shouldn’t avoid ever doing a reading on yourself, there is certainly no shame in seeking an objective opinion from a third-party Tarot reader. Getting a second opinion is always handy, and there are convenient ways to get other opinions besides asking a friend or mentor. For example, you can post your own reading on a psychic forum or another trusted site or contact a professional reader. You may have a subconscious agenda that is causing you to want to search out alternative meanings for the cards you have drawn in order to find the meaning that makes you feel the best. If you’ve ever seen a Tarot dictionary, you know that there are many interpretations available for each card. The only way to get better about this is to slowly gain more experience and grow your intuition. This pitfall is something you should avoid because it is challenging to read about someone else’s feelings or motives with true accuracy. It can be very tempting, especially since you are so invested in the outcome of your own reading, but you should be careful. While it is possible to pull a Tarot card to get a feel of the energy that another person is lending to a situation, you should interpret the information with caution. The best thing to do if you are looking for the cards to speak for someone else is to find someone else to perform that reading.